Domotz and Luxul have teamed up to launch a manufacturer support feature available in Domotoz Pro, a network monitoring and remote tech support system for integrators and IT professionals. 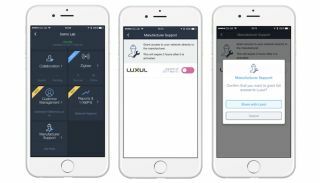 The manufacturer support feature enables installers to share access to a customer’s network with Luxul’s support team for real-time troubleshooting. Once a problem is resolved, the dealer can quickly revoke access. “Through our partnership with Domotz, Luxul integrators can ensure a properly configured, secured, and optimized network for their customers,” said Jeffrey Curtis, general manager and vice president of Luxul. “For our integrators, time is money. Giving them a simple method for accessing and collaborating with Luxul support resources via an interactive real-time troubleshooting session is groundbreaking. The manufacturer support feature in the Domotz Pro app is accessible remotely, so neither the dealer nor the Luxul support rep needs to be at the customer site. Once a Luxul device is found on a network using Domotz Pro, the support tile will appear on the dashboard. The dealer then grants the Luxul support team temporary access to any Luxul device, so they can work more closely with the dealer to investigate and resolve issues faster and with more intelligence. After the specified time threshold or once the dealer closes the support session, access to the network is automatically revoked. The new support feature is already live in Domotz Pro, so dealers just connect the Domotz Pro to a network with Luxul devices on it. Domotz Pro support features for additional hardware manufacturers will be announced in the months ahead.